On October 15, 1965 . . . 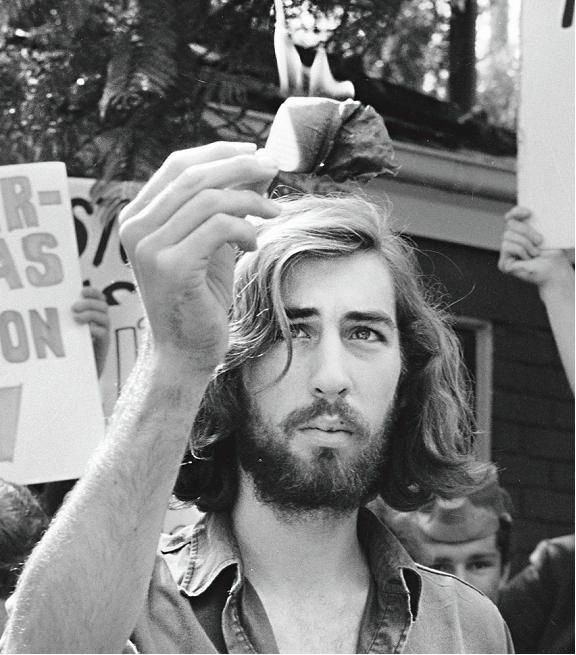 In a demonstration staged by the student-run National Coordinating Committee to End the War in Vietnam, the first public burning of a draft card in the United States takes place. The analogy turns on how Myers considers draft card burning as a symbol of induction into the anti-war movement. It would be hard to overstate the way Jesus’ baptism declared his resistance to the Judeo-Roman institutions of his day. Today, a symbolic act of resistance, an induction into what might be considered resistance to anti-immigrant sentiment, might be publicly declaring that you would open your home as “sanctuary” for immigrants at risk of deportation. For most of us who grew up Baptist in the past 50 years, baptism as a symbol has been more a church growth marker for denominational leaders and a form of personal security for parents and grandparents that their children and grandchildren will go to heaven when they die. We hardly, if ever, talk about baptism as a symbolic act of resistance. In the United States of America, we don’t have an Empire to resist, do we? Alan Wolfe, noted sociologist wrote, The Transformation of Religion in America where, after interviewing ordinary people about their view of religion, concluded that every religion that comes to our shores is forever changed. It does not maintain its original form. And, this includes Christianity where we could easily agree that how we view baptism today is nothing comparable to Jesus’ baptism, even if we are baptized into the Name of the Father, the Son, and the Holy Spirit. Rather than become obsessively concerned, angered or confused, let’s re-orient ourselves to Jesus’ baptism not so that we might feel a sense of guilt and shame but that we may see the Gospel enacted in the Baptism of Jesus. Let’s be reminded that what God revealed in Jesus at Jesus’ baptism is for us, for our incorporation and at least a sign and symbol of Jesus summing up the will of God that would result in the Cross and Resurrection. In short, Jesus’ Baptism tells the Story of God who is for Us. Baptism is not less than symbolic, but it is more. Baptism practiced as a symbol is the enactment of a spiritual reality involving the body. When we over-emphasize the spiritual to the exclusion of the physical, we miss the drama. We come perilously close to making an old mistake. Jesus’ baptism was physical. One of the errors confronting the early church was the idea that Jesus was a spirit-being, not a real-physical-human-being. Docetism viewed Jesus’ physical body as just a semblance, an “it only appears to be” sort of thing, not real. To move baptism to a merely symbolic, spiritual act, and then determining that it is past its best by date, we risk conveying the idea that what matters in life is an unseen spiritual reality. The physical is just a part of the journey we will one day no longer need. And with it, any hint that baptism-as-a-declaration-of-resistance is gone. Any loss of baptism-as-declaration-of-resistance proves Wolfe’s point, every religion that comes to our shores is forever changed. Maybe you see how the lack of connecting the meaning of our baptism with the meaning of Jesus’ baptism is one of the key moves that signals religion, even Christianity, has become a moral movement, ripe for a new legalism. When our baptism is stripped of its connection to the meaning of Jesus’ baptism we only have left things as they are. We create of Christianity something different than what it was. Rather than resist the temptation of earthly Empires we determine to influence them to be better moral actors. As such, the goal is to participate in the power of the Empire. When that happens, it is historically demonstrated that Christianity becomes something different than it once was. We lose the Good News. What difference does it make that poverty remains, people go hungry, human beings are judged by their differences, and those on the edges of society are deemed less important than any other so long as our lives change very little? If that is not Bad News enough, there is more. When our attempts to influence the Empire fail, we turn to our piety. We console ourselves with the conviction if we would pray and turn from our wicked ways things would be better. We miss that the error is trading Bad News for Good News, for thinking we could rehab the Empire rather than resist it. Our piety becomes therapeutic. This means that when our lives are difficult due to the forces that work against the Kingdom of God, we turn inward and make it all about our spiritual practices as if somehow God is looking for improved performance on our part. Why become a slave to a new law when you have been set free? Mark sets up the dramatic scene of Jesus’ baptism. Everyone in Judea and Jerusalem is coming to John to be baptized. The Text reads they were baptized “ by John.” The “in” crowd came to John to be baptized. Jesus comes out of nowhere from the North. Galilee and the areas north of Samaria were considered less than Judea and Jerusalem. Anyone from there would be immediately considered second-class, second-rate. Jesus comes to be baptized by John into the Jordan. The Jordan – the very water into which a leprous army commander washed in to become clean. The Jordan – the place where the waters were held back so the people could cross safely on dry ground to enter the land of promise. The way Mark adds to the drama is that those who came from the South were baptized of John in the Jordan. Jesus was baptized into the Jordan. Orthodox artwork illustrated this story by showing Jesus entombed in the water. Dramatically, Jesus comes up out of the water – pointing to Resurrection, and the Spirit descends like a dove. If we are still stuck on the idea that Jesus burned his draft card as an analogy, we will likely be looking for a dove rather than that which is like a dove. Analogies attempt to convey what is difficult to express. Jesus’ enactment of the Good News is that in his baptism he identifies with those who are sinners, will suffer with them in death, and be resurrected to new life. This is the Kingdom Good News. It runs counter, is resistance to, the kingdoms of this world. Notice that Mark moves the drama forward emphasizing the Baptism of Jesus with the Temptation in the wilderness. What will Jesus be tempted with but to yield to the ruler of this world? He will be tempted by the same desire for power that is in practice in his day, and in ours. Mark paints those who threaten in the wilderness as wild animals, those that minister to the One who is Good News for us are angels. Mark is interested in the contrast that illustrates Jesus is God’s Good News. Re-orienting ourselves around the meaning of Jesus’ Baptism calls attention to our induction us into a resistance movement – one that resists the lure of power, one that embraces the value of all human begins, one that acknowledges those on the edges of life in need of liberation and freedom. Re-telling the story of Jesus’ baptism is the reminder of the way God is for us and is God’s Good News. Parents, when your children trust Jesus and want to be baptized you sign up to be their conversation partner as they learn to resist the powers of this world. You become an avenue of the Spirit where they will learn to trust the weak things of this world in defiance of the strong. However, parents, if we have not burned our draft cards, we will not know how or what to help our children with only giving them an empty form of the Good News, which is Bad News. Church, our incorporation into Christ marks us as a resistance movement. You who are hearing the Good News today may too be incorporated into Christ. You who are in need of a community of people who will resource you with encouragement and fellowship to resist are welcome.